In 2011 the Kentucky Department of Fish and Wildlife Resources declared an “experimental” three-year Sandhill crane season. This hunt for Sandhills as well as other game coincides with the migration of Whooping Cranes putting this endangered species at a much higher risk of being shot (as proven recently in Jackson Co. IN with the death of Whooping Crane #605 – a state where it is illegal to hunt Sandhills). 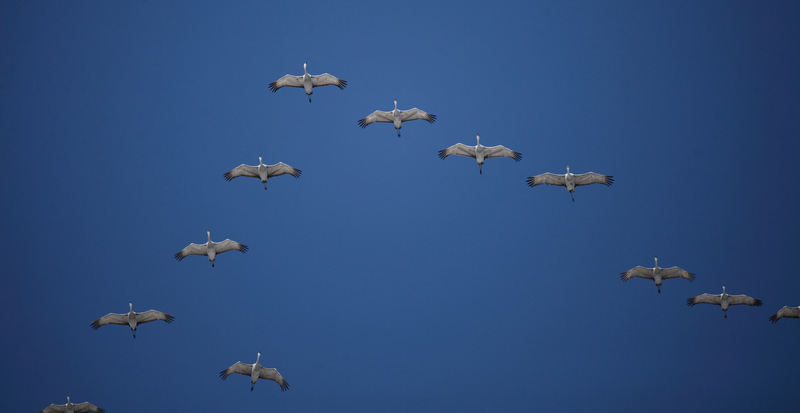 “Be Sure Before You Shoot – Distinguishing Geese and Sandhill Cranes“ is a video produced by the Texas Parks and Wildlife Department to help people identify/distinguish between Sandhill cranes, Whooping cranes as well as other avian species. While the video is intended for hunters in the Central Flyway, it can be applied to hunting in the Eastern Flyway. Please watch the video if you are a hunter, or if you have friends who are hunters, please pass it on. The Kentucky Department of Fish and Wildlife Resources requires all Sandhill hunt permit holders to pass a species identification test. The Kentucky Coalition for Sandhill Cranes is not an anti-hunting organization. This website is not the place to have a general philosophical debate about hunting. There is no chance that Kentucky is about to ban hunting, and that is not why we formed this Coalition. All who love the outdoors should value the contribution that hunting and fishing fees have made to the restoration and protection of wildlife habitat – and should support efforts to create similar funding methods for nonhunters. We are not trying to ban hunting or change any existing hunting regulation. We are trying to prevent the hunting of sandhill cranes in Kentucky. Like bald eagles, sandhill cranes are popular with the general public. We think that starting a hunting season on sandhill cranes risks alienating nonhunters and misses a great opportunity to encourage a greater connection between Kentuckians and the outdoors. Whether you hunt or not, if you agree with us that Kentucky does not need to start a sandhill crane hunting season, please join our Coalition.